Newer: » Noh Mul…No More! 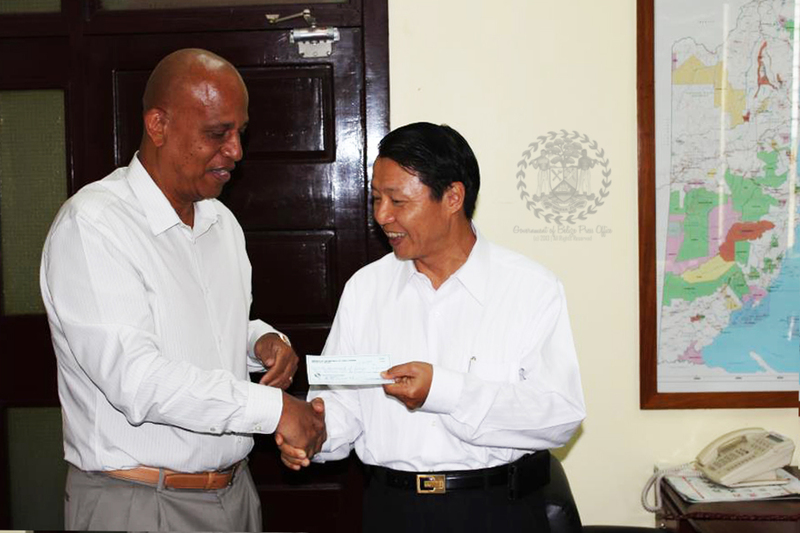 Press Release - Belmopan - May 9, 2013 - His Excellency Mr. David C. K. Wu, Ambassador of the Republic of China (Taiwan) presented a cheque in the sum of US Dollars Five Million to the Hon. Dean Barrow, Prime Minister and Minister of Finance of Belize on Thursday, May 9th. The proceeds of the Grant are for the general benefit and well being of the people of Belize. In particular, Government of Belize will use the funds to cover local counterpart expenditures on key infrastructure projects, including the Belize City Southside Poverty Alleviation Project Phase II, the extension of the Southern Highway to Jalacte in the Toledo District, and for the new crossing of the Macal River in San Ignacio/Santa Elena. In accepting the Grant, Prime Minister Barrow said: “Ambassador, please convey to your Government the heartfelt thanks and appreciation of my Government and those of the people of Belize. This cooperation program will go a long way in assisting Belize in meeting its development goals”.